We are proud to introduce one of the 1st Veterinary Hospitals to the Downtown Durham area. 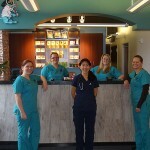 Our goal is to provide excellent veterinary care and exceptional customer service to the local community. Our state of the art equipment and trained staff will facilitate our goal. We emphasize the importance of continuing education to stay up to date with the latest studies and technology to be able to offer the best possible care to our patients.